This elegant beaded votive is made using high quality Swarovski crystal cubes, seed beads and Peel-n-Stick adhesive sheets. Adhesive sheets, along with sticky tape and sticky dot strips allows you to make stunning home décor items. The demonstrated votive is ideal for burning a floating candle*, holding potpourri, cotton swabs, cotton balls, make up brushes, etc. Note: Do not burn regular votive or tea light candles in a sticky tape votive. The heat may cause the adhesive to fail. A small floating candle may be burned when water is added to the votive at a level that will allow the flame to burn above the rim of the votive. Always supervise a burning candle and place away from drafts. For each side of the votive being decorated, cut out one 1-3/4 inch diameter circle from the Peel-N-Stick sheets. Remove backing and place on center of one side of votive. Remove protective covering from adhesive circle. Place medium yellow crystal cube on center of circle. Note: Be sure to align all of the crystals in the same direction for the most uniform appearance. For each petal, place one medium rose crystal directly over the top of the center yellow cube. Place four more rose crystals around the center yellow crystal at slight angles to form a five point star formation. These are the inside tips of each flower petal and will determine the alignment of each petal. At the end of each starting rose cube, place two rows of two medium rose crystals. These two rows should be centered over the first rose cube. To finish each petal, cut a 1/8 inch wide strip of Peel-N-Stick adhesive. Remove one side of the protective backing. Place five medium rose cubes on the exposed adhesive. Trim the excess strip away from each cube with scissors, leaving a small square of adhesive on each cube. Peel away backing and center over the end of each petal. Mix all three colors of seed beads into a mixing tray. Pour the mixed beads over the exposed areas of the Peel-N-Stick circle. If any areas remain exposed, press individual seed beads into place with fine-tip tweezers. Work over a bead cup or tray to catch the beads. For each side of the votive, cut a 1-inch x 1-inch square from the Peel-N-Stick sheet. Cut the square in half, diagonally. Remove backing and attach at the top left and right corners of each side on the votive. Remove the second backing and attach a medium yellow crystal at the corner. Apply four fuchsia crystal cubes on either side of each yellow crystal cube, along the horizontal and vertical edges (a total of eight fuchsia cubes will be needed for each corner). Pour the mint green seed beads over the exposed area of the adhesive triangle. 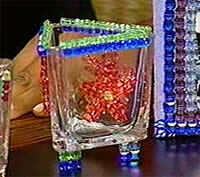 Fill in any exposed spaces with beads as described in Step 6. Apply 1/4 inch wide strips of the Peel-N-Stick adhesive along the bottom edges of the votive. Attach the large yellow crystal cubes side-by-side, along the entire length of each side of the votive to create a crystal pedestal. Repeat Steps 1 - 9 for the remaining sides.